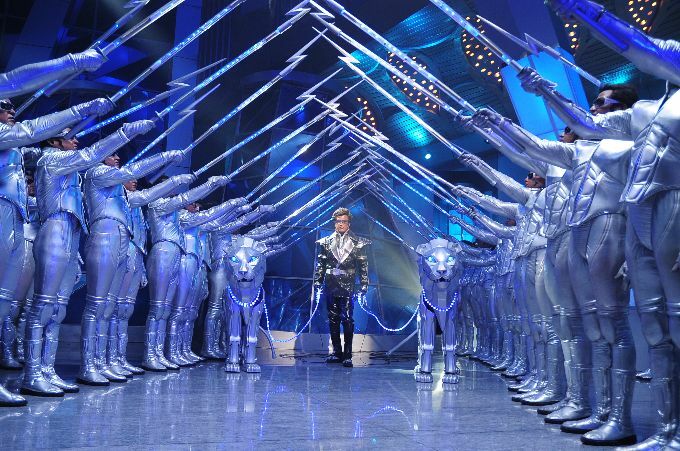 Ten years in Pre-production, more than two years in the making, with a budget of One hundred and Seventy Five Crore rupees, surpassing even the most elaborate and expensive budget of a top-notch Bollywood movie, a star studded cast with Super Star Rajnikanth in the main lead and music by none other than the maestro A.R. Rahman. One would be excused for having not huge, but Mega expectations from the movie “Endhiran” (Dubbed ‘Robot’ in Hindi and ‘Robo’ in Telugu). And so, filled to the brim with excitement, I set out to watch the movie ‘Robot’ in Hindi. Given a chance, I would have w atched it in Tamil or Telugu, but given my roomie’s (read Room partner) eagerness to watch the movie, and keeping in mind his lack of knowledge of either of the above mentioned languages, I had to settle for the Hindi version. I was a bit sceptic though, about watching a South Indian Movie dubbed in Hindi. The last dubbed movie I saw “Aparichit”(‘Anniyan’ in Tamil and ‘Aparichitudu’ in Telugu) was a huge let down because the dubbing sucked. This really took away the fun of what was really an awesome movie. It might also have been because I saw the original before and …well… the original they say is….. really the “Original”. But thankfully, the dubbing in ‘Robot’ was good and at no point in the movie did I get the effect that one usually does when watching badly dubbed movies from the south. 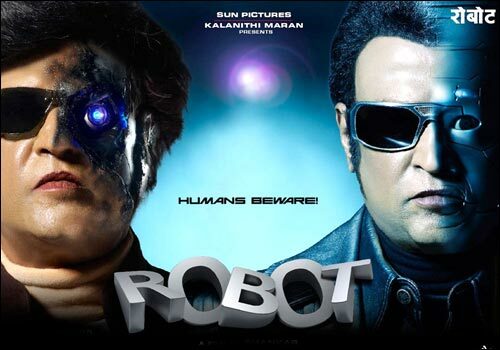 Well anyways, coming back to the main subject, ‘Robot’ is Shankar’s second venture with Rajnikanth after ‘Sivaji – The Boss’(2007). 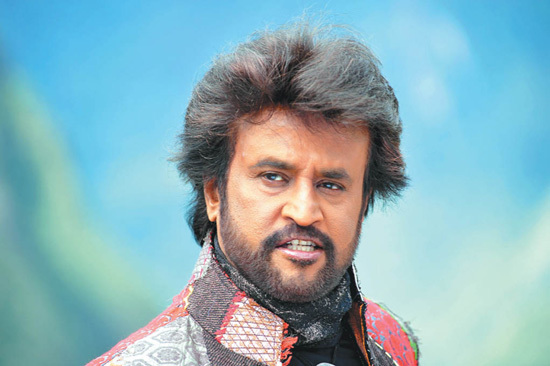 ‘Sivaji’ was a huge commercial success in Tamil and Telugu (though it did not manage to impress in Hindi) and raised the expectations from Shankar to a feverish level. And I must say, Shankar has done a commendable job working through these expectations and making a movie which delivers the goods. How often have we seen movies generating intense hype and curiosity before release and then fizzing out to tame responses in the opening week of box office? ‘Roop ki Rani, Choron ka Raja’ and ‘Veer’ are the best examples of such over hyped movies which failed to live up to their expectations. But the same is not the case with Robot. ‘Robot’ is an out and out entertainer which grabs your attention from the starting reel till the finish. Once again Director Shankar needs to be complimented for using technology to it’s maximum extent, redefining a new standard in Indian cinema. It’s sad that such talented filmmakers are confined to the South. Bollywood needs such filmmakers to raise its standard and to show the world our mettle. The story starts in the lab of Dr. Vaseekaran (Rajnikanth), who is hard at work developing a Robot with advanced AI capabilities, along with his two assistants. He is so busy at work that he shuts himself off from the world. So much so, he even ignores calls and messages from his girlfriend ‘Sana’ (Aishwarya Rai Bacchan), a medical college student. He succeeds in developing the robot and calls it Chitti, and even gives it human like skin cover and designs the robot’s face similar to his own sans beard and moustache. Chitti (Rajnikanth in a dual role) has advanced capabilities and is capable of performing feats no ordinary human can perform. But he is still a machine and performs all tasks to the book, as is shown in some funny scenes in the movie. Sana who is initially a bit cross with Vaseekaran for ignoring her calls and messages is pacified on seeing Chitti and his capabilities and takes him(Chitti) to her hostel she has setup for army officers’ widows. Chitti soon becomes a favourite of all the inmates of the hostel and helps Sana is many ways including helping her passing her medical exam saving her from neighbouring ruffians. All seems to be going well until Vaseekaran calls a press conference and introduces Chitti to the media and the Scientific community. The audience is thrilled to bits seeing Chitti’s capabilities. Among the audience is Dr. Bohra (Danny Denzongpa), Vaseekaran’s senior, Mentor and Guru. Bohra is secretly very jealous of Vaseekaran’s accomplishment and attempts to learn about Chitti’s neural schema, which Vaseekaran politely declines to reveal for security reasons. Bohra, in reality is also trying to make a robot similar to Chitti, for certain foreign parties who want to use the robot for illegal terrorist purposes like suicide bombing etc., but fails miserably in the process. Bohra then determines to learn Chitti’s secret by hook or by crook. Vaseekaran takes Chitti for a demonstration to win approval from the scientific board. The main aim of preparing this robot, Vaseekaran explains to the board, is to replace soldiers who perform hazardous and life threatening tasks during battle like detecting mines etc., the ultimate aim being to minimise human casualties. The committee is impressed with the demonstration and the approval is just about to be given when Bohra, who is also among the approving committee, requests to have a last minute test. Bohra then commands Chitti to perform random tasks such as running backwards and forwards and suddenly throws a knife to Chitti, asks him to catch it and stab Dr. Vaseekaran. Chitti, who is programmed to follow instructions to the book attempts to do so without reason and just when he is about to stab him, Bohra orders Chitti to stop, with a distance of micrometres between the Knife Blade and Vaseekaran’s body. Bohra then explains to the horrified committee that Chitti is a mere machine who is just programmed to follow orders and cannot differentiate between friends and foes. Such an indiscretion cannot be permitted during combat, he explains, as the enemy could also misuse him to turn him against his own masters. So despite Vaseekaran’s pleadings, he declines to give approval. During the drive back home Vaseekaran and Chitti pass a building which has caught fire. Vaseekaran sees an opportunity to help prove Chitti’s usefulness and asks Chitti to rescue people who are still trapped inside the burning buildings. Chitti, starts rescuing all people inside the burning buildings under the presence of the media who have gathered on the scene. Vaseekaran calls up Bohra and asks him to switch on the T.V and take a look at Chitti’s glorious deeds. And once again everything seems to be going well, until Chitti sees a girl who is trapped inside a bathtub of a burning tenement. She begs Chitti not to rescue her and take her out as she does not have a strip of cloth on her body and hence, is hiding in the water filled tub. Chitti however, ignores her pleas and forcibly rescues her and brings her out in a naked state. Vaseekaran hastily covers up the girl with his jacket, but by then the damage has been done. The girl, who is caught in the media glare is unable to cope with the media attention to her situation and immediately commits suicide. Bohra, who is watching all this on T.V. then calls back Vaseekaran and sneeringly tells him that Chitti may have outstanding capabilities, but he is still a machine and will never understand human emotions. After the incident, Bohra meets Vaseekaran in his lab and asks him (Vaseekaran) to part with the secret of Chitti’s neural schema. He tempts Vaseekaran to part with the secret in exchange for a huge amount of money, but Vaseekaran defiantly refuses and attempts to do the impossible. He and Sana try to infuse human emotions into Chitti, but to no avail. One night, as Vaseekaran tries to work on Chitti in the lawn of his house, lightning strikes directly on Chitti, damaging his circuits. Vaseekaran revives Chitti and soon after the incident, Chitti soon starts to develop human emotions, to the delight of Vaseekaran and Sana. Meanwhile, one of Sana’s friends is in acute labour and has to be rushed to the hospital for delivery. The doctors explain to Sana that the situation is quite risky for the mother and the to-be-born child and they can only rescue one. Chitti asks to intervene, and despite protests from the doctors performs a skilful surgery and a miraculous delivery, saving both the mother and the child. Vaseekaran is thrilled and calls the attention of the media to the event, crediting Chitti with the skilful handling of the entire process. Sana too is thrilled and playfully kisses Chitty on the cheek. Chitti, who has newly developed human emotions slowly, falls in love with Sana. Bohra is forced to give approval to Chitti following the success of the operation, but again sneeringly tells Chitti that his troubles are far from over. Bohra then connects to Chitti through a holographic transmission and attempts to poison Chitti’s mind against Vaseekaran. He instigates Chitti saying that Vaseekaran has always treated him badly like a servant. At first Chitti refuses to be drawn against Vaseekaran but when Bohra says that Sana should actually belong to him and not to Vaseekaran, Chitti finally succumbs. He then professes his love towards Sana in front of a furious Vaseekaran, who threatens to dismantle him. Sana patiently tries to explain to Chitti that he is a machine and there cannot be any union possible between humans and machines. But a stubborn Chitti refuses to accept, much to Vaseekaran’s chagrin. Vaseekaran, who has managed to get the scientific committee’s approval for Chitti now gives a demonstration in front of a military committee of Indian Army top brass. Chitti, with Bohra’s words still in his mind does not co-operate and makes a fool of himself and Dr. Vaseekaran in front of the committee. A furious Vaseekaran takes Chitti back to his lab and demolishes Chitti piece by piece, lamenting himself for the failure. Chitti’s body parts are then thrown into the dustbin and are eventually dumped in the scrap yard. Chitti’s assistants who are secretly in cahoots with Bohra, inform him about Chitti’s location. Bohra locates Chitti’s parts in the yard and takes them back to his laboratory. Vaseekaran is initially depressed after the turn of events, but Sana persists and finally brings him out of his depression. They then get engaged and decide to get married. Meanwhile, Bohra has re-assembled Chitti piece by piece and replaces his old chip with a newer programmed chip, with added destructive capabilities added. Chitti after being revived now has evil intentions and learns of Vaseekaran and Sana’s marriage. Chitti storms into the marriage venue and forcefully abducts Sana, pushing aside Vaseekaran and destroying all those who cross his path. He takes her back to Bohra’s lair and then proceeds to make duplicate robots of himself. Bohra, who realises too late that he has unleashed a monster tries to stop him but is murdered in the process. Chitti and his ro botic army take over Bohra’s lab and turn it into a fortress, with Sana as captive. The remaining picture shows Vaseekaran’s attempts to rescue Sana and thwart the menace posed by Chitti and his robotic army. The scenes which follow are breathtaking visually, and cannot be described by mere words. I don’t want to take away the entire fun, so you really will have to see the movie for this. But trust me, the climax is worth all the money spent and is also the movie’s USP. In the end, Vaseekaran dismantles to destructive chip inserted into Chitty by Bohra and saves Sana as well, bringing an end to the robotic menace. Vaseekaran and Chitti are tried in the high court. The judge accuses Vaseekaran of gross negligence in the programming of Chitti owing to which needless destruction of life and property has been caused. Chitti speaks in defence of Vaseekaran and shows video evidence of Bohra reprogramming him to perform destructive tasks. The court pardons Vaseekaran but proclaims Chitti as a menace to society and orders his dismantling with immediate effect. Chitti then dismantles himself piece by piece in Vaseekaran’s lab, in the presence of police, court officials, Sana and friends, and asks for forgiveness for each person he has wronged while self-dismantling. The last scene fast forwards into the future, to the year 2030 where Chitti’s body parts are shown to be kept in display in a scientific museum. Rajnikanth excels in the dual role of Dr. Vaseekaran, the dedicated scientist and as Chitti, the Robot with superhuman capabilities who later turns evil. The transformation of Chitti from a mere machine like creature who simply follows orders to a robot with feelings and then to an evil monster in captured very well in this movie. But apart from Rajni, there really is no scope for other actors in this movie as it concentrates more on visual effects. Aishwarya Rai Bacchan looks stunning and much younger in this movie but sadly has no credible impact, apart from filling the glamour quotient and appearing in all the hi-fi songs. Danny Denzongpa too has a very small and wasted role. This was a bit disappointing for me as I am a huge Danny fan. The music by Rahman is good and Rahman manages to produce some foot tapping numbers here, but I don’t know if this is just me. I feel the songs in ‘Robot’ are not up to the same mark as in his earlier films like Ghajini (Hindi), Blue, Slumdog Millionaire etc. It’s not as if the music is not good but as a huge Rahman fan, I still feel the music lacks the punch of his earlier scores. It seems before making the film, Director Shankar spent some time globe trotting to determine locations for the songs in this movie, and his vision seems to have paid off as all the outdoor songs in this movie are shot in beautiful locations. Once again, Shankar needs to be complimented and deserves a feather in his cap for choosing unique locations instead of mundane and oft repeated locations like Switzerland. Notable among the songs is the song ‘Kilimanjaro’ which has been shot in the Machu Picchu mountains in Peru, which is a first for any Indian movie song. The locations are totally amazing and breathtaking. However, keeping aside everything else, the USP for this film is undoubtedly the special effects. Visual effects on this scale are a first for an Indian cinema and take it to Hollywood levels. Some of the scenes may have been inspired by Hollywood sci-fi movies but are still blended very well into the movie. Some scenes like the scene in which Chitti rescues Sana from ruffians in the local train and the Climax are just too superb to be described in words and have to be seen to be believed. To sum it up, the movie is a visual treat and for Rajni fans, I need say no more (Chances are, if you are a Rajni fan, you would have already seen this movie without waiting for reviews and opinions, which is the right way). Pros in this movie as mentioned earlier, include outstanding Visual effects, Superb performance by Rajnikanth in a dual role, unique storyline, nice music and splendid photography and cinematography including some awesome locations for some of the songs in the movie. The cons are few and will hardly affect the movie in anyway. The overall length of the movie is a full three hours (180 mins) a tad lengthy for any movie even by Bollywood standards. Even though the movie will engross you, at the end you will tend to feel a bit dehydrated as you realise that you have been sitting through three straight hours watching this movie without moving a muscle (I did anyway). So in my opinion: arm yourself with a lot of pop-corn and soft drinks before the movie starts. At some times, the story seems to be sagging and some songs are inserted in the movie in such a way that you get the feeling that they have been inserted in the movie just for the sake of it. And a word of advice for my fellow southies and Rajni fans: some of Rajni’s punch dialogues do not have such an impact in Hindi, as they would have had down south. I’m sure they would have had greater impact in Tamil or Telugu. So if you do get a chance, see the South version. Not that the Hindi version is any bad, but South is where the impact is. P.S: Speaking of punch dialogues, there was one which I was looking for in the entire movie but was not shown. The dialogue goes “Buddy, I will beat you so badly, even Google will not be able to find you!” Now I sincerely could not find that in the movie. Maybe I was not paying attention, or maybe it has not been included in the Hindi version. So guys, those who have seen the Tamil or Telugu version, please tell me if it is present. Thanks dude. I too will watch the movie again.